It may seem odd to some, but in the era between WWI and WWII, Boeing was actually known for producing fine pursuit aircraft. This was all done in-house, not by taking over other companies as is done today. While many of their (and others) projects never reached production status (as much by the lack of available funds as anything else), one that did was the P-12/F4B family. 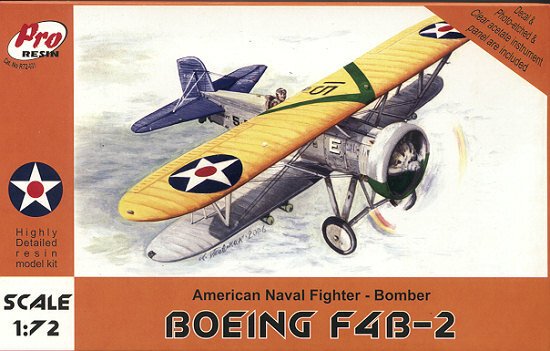 The F4B was the naval equivalent of the Army's P-12 and basically had some small modifications made to allow for use on aircraft carriers. The subject of this kit, the F4B-2, was roughly equivalent to the P-12C in terms of the airframe and engine. It had ailerons on the upper wing only and had a Townend Ring covering the outer cylinders. It also had a cross-axle landing gear and larger elevators. The F4B-2 had a tail wheel rather than the skid used by the Army. This was all pulled through the air by a 500 hp Pratt & Whitney R-1340. 46 F4B-2s were ordered to equip two squadrons, with deliveries starting in January of 1931. VF-5B aboard the USS Lexington was the first, followed by VF-6B on the Saratoga. These aircraft were also equipped with the ability to carry four small 50 lb bombs under the wings. Surviving airframes were later modified with the larger tail seen on the F4B-4. Olimp kits come in rather sturdy boxes. Mine was even more protected by having Styrofoam sandwiched inside the box to keep the bits from moving around too much during shipment. Despite all this, a few bits came adrift from the resin pour stubs, but nothing was damaged. The parts are quite well molded and though I saw a few air pockets, they should be easy to fill. The wing leading edge is a bit ragged, but this is probably where it attached to the pour stub. Some other clean-up will be needed as with all resin kits. The level of detail is quite good as the interior has nicely molded framework. The fabric is also nicely done and if you think it is a bit too pronounced, a simple sanding will cut down on that. I have to say that I'm somewhat concerned that the scale thickness of some parts (like the tail skid) may make the parts a bit too thin to withstand any sort of weight, but we'll just have to see. 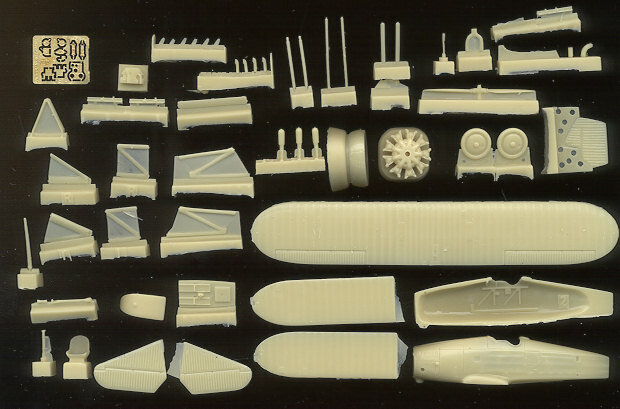 As this is the Navy kit, there is a sprue for the arrestor hook, bomb racks and the bombs. Etched brass is used for the instrument panels, rudder pedals, seat belts and gun sight. Acetate (not shown)is provided for the instruments and windscreen. A single sheet of folded paper is provided for the instructions. It includes a history section, parts layout and four construction steps. In with these steps and smaller alignment drawings to help with construction. Color information is provided during construction. References for color are by Humbrol, Model Master, Revell and generic name. A rigging diagram is also provided. One thing I wish would be changed is that a color chart in grey shades is provided on the painting diagram. I'd much rather have all the colors clearly identified as I have trouble differentiating between the different shades. Pro Resin does point out the smaller areas and their colors, but I'd like it all to be so identified. I should also point out that the underside of the upper wing on Navy aircraft of the time was in aluminum dope and the upper yellow wraps around a small amount. The instructions show the interior as being Aircraft Grey, but I believe they were probably silver. Markings are for two aircraft. One is the box art plane from VF-5B aboard the USS Lexington in 1932. 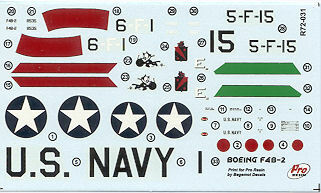 The other is for a VF-6B aircraft on the Saratoga in 1931. As the CO's plane, this one has all the bands and cowling in red. Decals are well printed and matte. I found them to be fairly good on other ProResin kits I've built. The green does look a bit too light for my tastes so perhaps painting those stripes wouldn't be a bad idea. This is another superb resin kit from ProResin. As the name suggests, there are not for beginners in the genre, but for those experienced, they should make excellent models. Because of the small parts, I'd recommend a few simpler resin kits before tackling one of these. My thanks to for the review kit. If you would like your product reviewed fairly and fairly quickly by asite that has nearly 350,000 visitors a month, please contactme or see other details in the Note toContributors.